This is the first book by Jeff VanderMeer that I have read. He has been on my radar for a while though as his books have kept popping up as recommendations on Goodreads and Amazon. 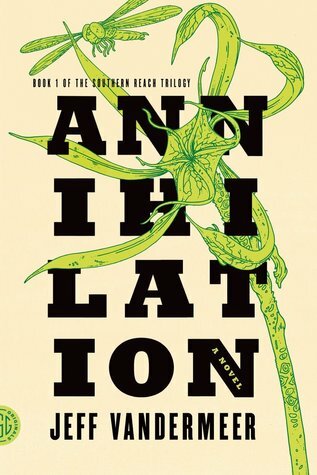 Annihilation is the first book in the Southern Reach trilogy, all books being released in 2014. This first book is pretty short (approx. 200 pages). Personally, I think I'd have preferred one chunky book rather than three short books - I have thought this on several occasions with series which consists of lots of short books. The next two books in the series are much longer though so I can kind of see why it's been done like this. Also there's a growing trend of releasing sections of books a little like TV episodes of a series - another book series like that which springs to mind is the Wool series by Hugh Howey. Back to this book! A team of four women are chosen to enter Area X, where many teams of scientists have gone before them, most of which didn't come back or came back changed in some way. So from the outset you know things aren't going to end well! I enjoyed the book and I read it quickly and I wanted to find out more but it was lacking but I'm not sure why. I thought the ending was a little vague but that's because there are more books to come. I wrote the review above shortly after I read the book (back in June 2014) but since then, it has grown on me and I think I would probably rate it higher now as I look back on it with fondness! It was a strange little book. I recently entered a competition on Goodreads to win the third installment, Acceptance, and I WON!!!! I was so excited! So I bought book two, Authority, so that I can continue on with the story. When my prize book arrived, I noticed that Stephen King, one of my favourite authors, had blurbed the book stating that he had enjoyed the whole Southern Reach trilogy and that it was creepy and fascinating. Now I'm even more excited to get back to the series, especially as I have heard some very good reviews about the third book finale!